The M16 rifle, officially designated Rifle, Caliber 5.56 mm, M16, is a United States military adaptation of the ArmaLite AR-15 rifle. 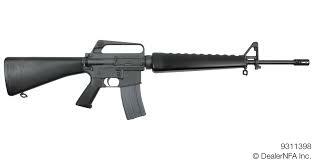 The original M16 was a 5.56mm automatic rifle with a 20-round magazine. ... In 1969, the M16A1 replaced the M14 rifle to become the U.S. military's standard service rifle.